After singer Sinéad O’Connor’s controversial ‘SNL’ performance on October 3, 1992, where she tore up a picture of Pope John Paul II, the Crypt Keeper, the undead host of the horror anthology series ‘Tales From The Crypt,’ was absolutely furious. Here are five episodes of ‘Tales From The Crypt’ where the ghoulish master of fright was so angry about O’Connor’s disrespect toward the pope that he could barely host the show. 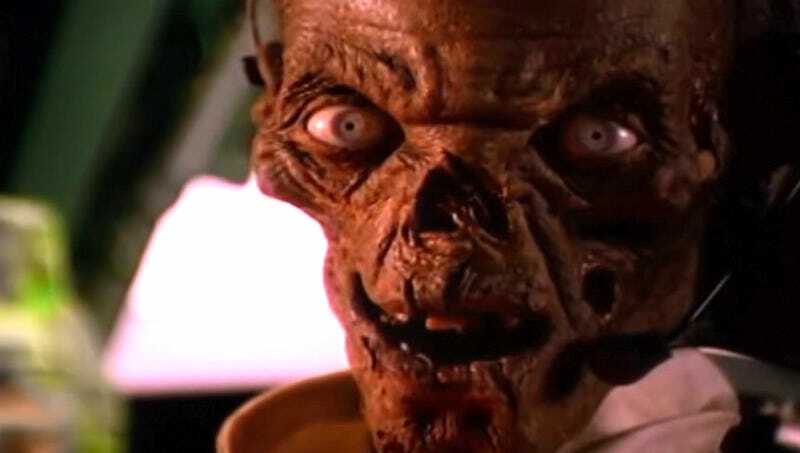 This was the first Tales From The Crypt episode to air after O’Connor ripped up a picture of Pope John Paul II on Saturday Night Live to protest the church’s child abuse scandal, and it was immediately clear that the Crypt Keeper was pretty worked up about it. The undead lich called O’Connor’s actions a “grave insult that disrespookted an inspirational leader to millions of Catholics around the world. Saturday Nightmare Live owes viewers an apology for letting Sin-ache O’Gonner R.I.P. the pope’s photo on television.” The Crypt Keeper was so livid that he railed against the Irish singer for the entire opening segment without introducing the following story about a dishonest salesman held prisoner by a family of murderous hillbillies. On the very next episode of Tales From The Crypt, viewers could tell that the Crypt Keeper was still furious against Sinéad O’Connor when he spent most of his monologue praising Joe Pesci’s appearance on SNL because the actor said he would have smacked Sinéad O’Connor if he had been hosting SNL during her stunt. “I’m glad to see Joe Fleshi knows fright from wrong, unlike the rude Ms. O’Gonner,” cackled the Crypt Keeper before bowing to a framed portrait of Pope John Paul II and praising the religious leader for standing firm against the evils of racism and abortion. On this episode the Crypt Keeper completely lost his cool. He spent the first 15 minutes of the show angrily trashing his subterranean mausoleum, hurling chairs and decorative skulls to the ground and shouting, “When Ms. O’Gonner was on SNL she was a guest of Lorne Mic-hells, and a guest shouldn’t put their host in an awkweird situation by ripping up a gore-trait of his howliness Pope John Gall II, the divine representative of our Lord and Slayviour Jespus Christ.” By the time the Crypt Keeper had calmed himself, there wasn’t enough time to start the spooky tale. This 1994 episode about two martial artists forced to battle to the death featured a guest cameo by Wayne Newton in the role of fight promoter Wink Barnum, and the presence of a singer apparently reminded the Crypt Keeper about Sinéad O’Connor tearing up the photo of the pope. In his intro, after praising “Brain Newtscum” as an “actually talented and good musician,” the Crypt Keeper then assailed Sinéad O’Connor by pointing out that her breakout hit “Nothing Compares 2 U” was just a new arrangement of a Prince song and her entire career was built on another musician’s creativity. In this 1996 episode, the Crypt Keeper revealed he was still nursing a grudge against Sinéad O’Connor, even though years had passed since the incident on SNL. Rather than setting up that night’s scary story, the Crypt Keeper instead began yelling that “Sin-ache O’Gonner has yet to apologize for disgracing the Cathol-eek Church on S.N.HELL all those years ago.” The episode’s scary story then started playing, but the Crypt Keeper continued ranting in voice-over throughout the entire show about how Sinéad O’Connor “should be six feet under because nobody can pallbear her voice so nobody ghost to see her conchurts,” which completely derailed the entire program.